When the scariest thing about Bigfoot in a film is either a horrendous looking CGI wire frame of the creature or two former child stars way past their prime (and talent) you know you're in trouble. 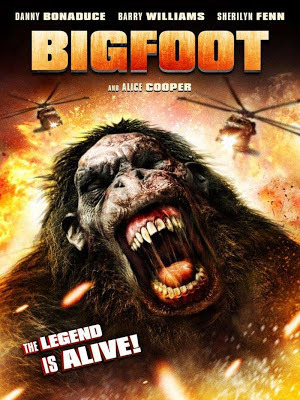 Bigfoot deals with the famous urban legend creature rampaging his way through most of South Dakota and Mount Rushmore with Danny Bonaduce and Barry Williams in hot pursuit. Throw in a few more where-are-they-now actors (Sherilyn Fenn, Howard Hesseman) and you have yourselves a big steaming pile of cinema perfect for drinking games. Actor Bruce Davidson most have lost a bet with Asylum productions, because he both stars AND directs this nonsense. This lame turd is available right now for steaming on Netflix and VUDU, but just listen to the podcast and save yourself the eyestrain.